When I mentioned - oh dear, is it two weeks ago already or just one? 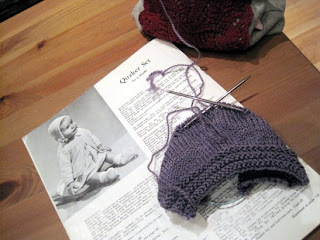 - that I was hunting for a baby sweater pattern for some luscious new yarn, Kate suggested I check out Grumperina's blog for ideas. 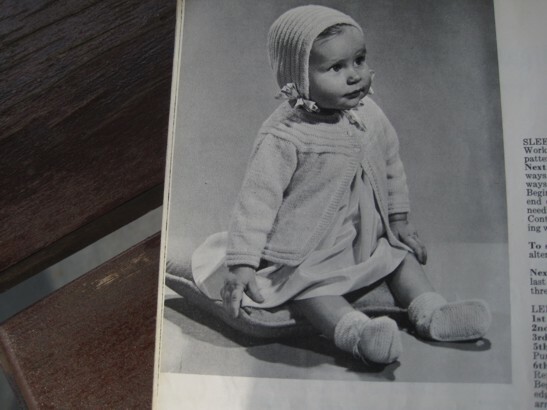 Well, it turned out my favourite of Grumperina's baby sweaters was from a vintage pattern. Of which I have rather a lot, myself. Why didn't I think of that before? 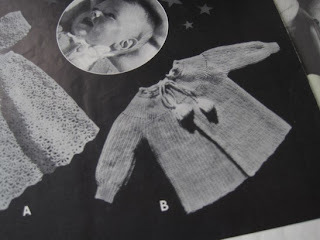 As time permitted, I went through the (many) booklets of baby-centric ones and narrowed it down to these two Patons Beehive options, the only ones that meet my need for gender neutrality on the question of button bands. This one is a bit sneaky; the body and sleeves are worked first (flat, sadly, with front and back body parts worked separately), then joined for the yoke, which is the only place where buttonholes are present. So in theory, I could knit the majority of it, then set it aside till after the baby is born and do the yoke and button sourcing when I know whether my friend had a boy or a girl. This one uses a pom-pom closure, thereby avoiding buttons entirely. Plus: super cute. But... it's actually written for two colours, is in a 3-month size (which is practically newborn by todays' birthweight standards), and that pompom on string closure kinda spells safety risk to paranoid me. Have a great weekend - see you on Monday! Vintage baby patterns are so pretty. I still have the patterns my mother made for my sister and me, and our children.